Ex-British and Commonwealth champion Kevin Mitchell is considering retirement because of a pay dispute with his promoter. Mitchell, 26, is provisionally lined up to fight European lightweight champion John Murray in April. But he is yet to agree to the purse being offered by Frank Warren. The BBC understands that he is being offered less than half the fee he got for his last fight - a defeat by Australian Michael Katsidis. "Kevin is tied in to a five-fight deal with Frank Warren, which means he can't go and box elsewhere. He won't accept the fight unless the money is dramatically improved, which could leave him with nowhere to go," a source close to the fighter told the BBC. "If he doesn't take the fight then he faces the prospect of having to hang up his gloves while he's still in his prime. "If this happened it would be a real shame for himself, his fans - and for Warren." In his seven-year professional career Mitchell has forged a successful working relationship with Warren - including British and Commonwealth title success and last year's shot against Katsidis, though that fight was to end in disappointment as he was stopped for the first time in his career in front of 18,000 fans at West Ham's Upton Park stadium. The wrangle over fees could threaten Mitchell's relationship with the man who helped define his career. But the source added: "Kevin remains loyal to Frank, and always will. This is purely a business issue. Kevin knows his career won't last forever and he needs to start setting himself up for the future." Mitchell possesses an impressive ring record of 31 wins and only one defeat from 32 fights. 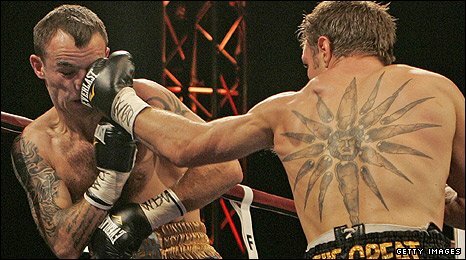 However he was signed off boxing for most of the last year following that defeat by WBO interim lightweight champion Katsidis because of skewed vision caused by the force of the Australian's punches. While waiting for surgery the British Boxing Board of Control revoked the Dagenham fighter's ring licence but with his eyesight now corrected Mitchell has been given the green light to get back into the ring. He is scheduled to fight the unbeaten Murray on the undercard of Nathan Cleverly's WBO light-heavyweight title fight against Juergen Braehmer at Wembley Arena on 2 April though he may reconsider without an increase to his purse. "In the past two years Kevin has suffered two serious injuries and has taken more than 12 months off recovering. If he were to get injured again, the money he is being offered won't stretch very far. Kevin has two kids and needs to start thinking about life after boxing," the source added. On Monday Frank Warren told the BBC: "It's on record that Kevin has said I've supported him in the past. I've helped him to meet his mortgage repayments. "Its also on record that for the last fight he didn't prepare properly, that set him back. He hasn't fought since because he's been out with an injury. "We understood he'd been to see a specialist a year ago and told us he'd had the all-clear. That didn't turn out to be the case. "He's been offered terms, and turned the fight down despite asking me to make the fight. If he wants to fight, the contract is there. The terms are over and above what was offered in his contract signed last year. Personally, I am disappointed to hear that he is considering retirement."